The search for the UK's 2018 culinary superstar continues. In the last heat of the competition, the final six chefs enter the MasterChef kitchen to face the skills test. In the last heat of the competition, the final six chefs enter the MasterChef kitchen to face the skills test, the first vital step to becoming the MasterChef: The Professionals Champion 2018. Under the judges' steely gaze, the chefs have to show they have the true grit and pure talent to mark them out as a future star. The contestants are hoping to sweeten the judges with their take on Marcus's dish of caramelised pineapple with a caramel nut garnish. 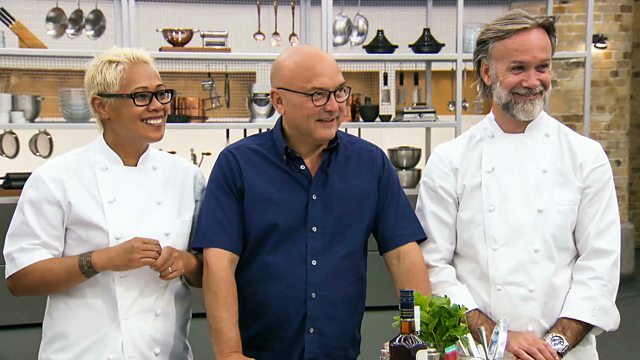 Monica, Gregg and Marcus scrutinise the chefs' skills as they pare down the pineapple and aim for the perfect flavour in their fruit caramel dessert. Temperatures, timings and impeccable prep are all on show in this test. When the last three chefs step in for Monica's test, they are faced with chicken carcasses, which form the basis of the dish they have 15 minutes to cook, glazed chicken oysters with pomme puree. The chefs need to butcher the carcasses down further to locate the 'oysters', before they can cook and glaze the meat, whilst also whipping up a perfect smooth buttery pomme puree to the judges' delight or distaste. Next, all six chefs must complete the signature dish round, in which they showcase their cooking style and creativity using their very own recipes. Everything rides on how they perform under the intense pressure of this round. The surviving three chefs move on to battle it out for another day in the last of the quarter-finals.